Barr. Engr. Victor Ochei. Unveils his drive for governorship aspirant under the APC platform come 2019. Our reporter came across this on facebook, where one of his aid uploaded this. He actually shared it in must groups where facebook users confirmed it to be true. 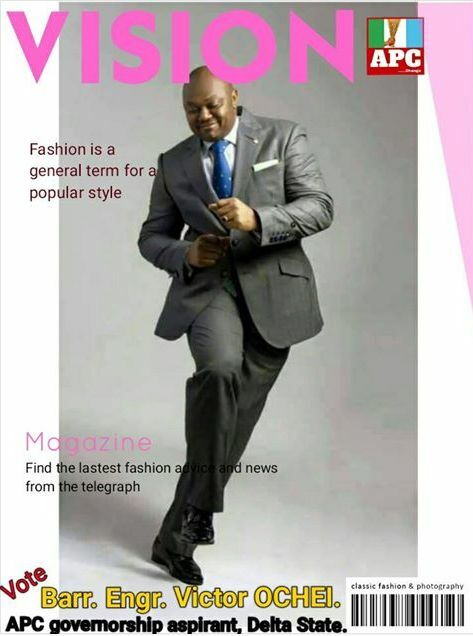 Victor Ochie is the first aspirant to come out on a magazine who is running under the apc party in delta state come 2019 gubernatorial elections. We look froward to seeing more aspirants, even though it seems Governor Okowa of Delta State is yet to have an opponent from PDP, Ochei could actually be a threat to him you know, because both are from the same part of Delta North.